Brighton Town Hall is located at 2300 Elmwood Avenue, Rochester NY 14618; phone 585-784-5250. Photo: Alcoa Care-free Home, ca. 1957, 1589 Clover Street, Brighton, NY. Making a reputation as a trend-setter in use of materials and their fabrication, the Aluminum Corporation of American hired world-renowned architect, Charles M. Goodman in the spring of 1957 to design the "Alcoa Care-Free Home." An advertisement of the time announced: "To make a reality of your dreams of lighter, brighter living." Alcoa relied on the genius of Goodman, famous for his residential designs, and the creator of plans for 38,000 postwar homes. 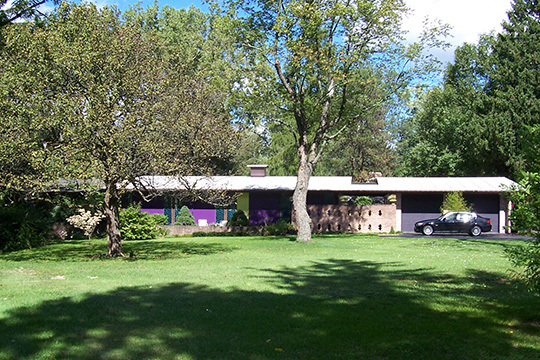 The result was the "Alcoa Care-Free Home" of 1957, with more than forty houses eventually built in 15 states across the country, including this one in Brighton, NY, one in Hollin Hills, Virginia, one in Pittsburgh, Pennsylvania, and one in Lafayette, Indiana, among others. Listed on the National Register of Historic Places in 2010. Photographed by User:DanielPenfield (own work), 2012, [cc-by-3.0 (creativecommons.org/licenses/by/3.0)], via Wikimedia Commons, accessed April, 2015. Originally the town of Brighton was known as Boyle, afterwards as Smallwood. Its present name was taken from the English watering place in Sussex. One of the towns which has given most of its territory to the fast-growing city of Rochester, Brighton had in 1930 a population of 9,033, in 1937 an estimated population of 10,000 [2009, approx. 35,000]. It lies along the complete southern boundary of Rochester from the Genesee eastward to Pittsford Township with a spur extending north several miles along Rochester's eastern border, covering in all an area of 14.3 square miles. It has no incorporated villages. Its residents occupy either farms or home sites convenient to business activities in Rochester. The town [in 1939] has 4 fire companies, a new high school, and 5 district schools. The initial tax rate is $10.10 per thousand dollars assessment. The school tax ranges from $4 to $8 per thousand. Brighton takes its water supply from the Rochester and Lake Ontario Water Company and its gas and electricity from the Rochester Gas and Electric Corporation.